Sometimes you need a push- or for me a shove or several- to stretch wings and try new horizons. Recently the suggestion was made that I should make available a pattern to sell for the Autumn Gnome. It took some prodding. Sheer terror at first, contemplating the task of tackling new computer gymnastics to layout the pattern to a set format. Focusing on all the imagined difficulites and inabilities can certainly magnify obstacles and fears. I am so fortunate to have had help, the faith of others and their support and encouragement to get started and keep on track. Once begun there were some hysterics and messups but no way so difficult as the imagination would have it. However, I will admit to several days that could only be described as a classic comedy of errors. There also was a deadline- the patterns were to be ready for sale at the end of term craft stall . It has been a really good experience in learning more about the computer- having to take the time to discover new aspects. There always seems to be so many good reasons to not have enough time to try out and just experiment and dabble. 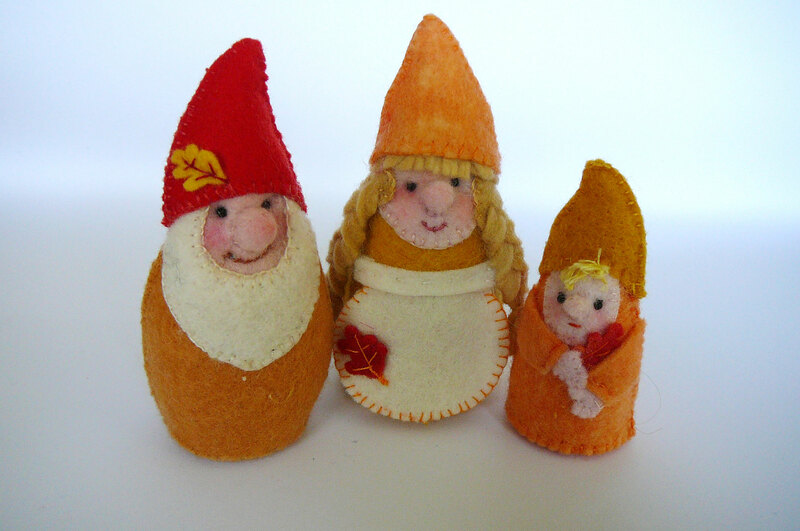 The Autumn gnome now has a family- a gnomette and a gnomling. They are depicted here as seasonal representations for Autumn but you can change their colours and functions easily. My aim is that they encourage imaginative fun and play as well as inspiring others to let their creativity blossom. The patterns are available from Mia at Toadstool House. So totally delightful! I’m not sure I get where to go for the pattern.